What do Elvis Presley, Janis Joplin and Bob Marley have in common ? Not too difficult a question. They were all great stars and for one reason or another sadly died too young. Their stardom and early demise is indicated by the fact that they all have the Sun in opposition to Pluto. This combination is happy to give us some of the greats but is equally comfortable with taking them away again just as we were applauding for an encore. The conjunction has just as much influence, having brought and removed Michael Jackson, Jerry Garcia and Bill Haley. Apart from Bob Marley, it could be said that all of these musicians’ lifestyles contributed to their early deaths. The whole live fast, die young theme is so much a part of rock music even to the point where Roger Daltrey of the Who sang ” I hope I die, before I get old “. Pluto basically has two themes, intensity and death. This does not generally mean our actual death, it is more about deep and profound transformations that occur in life where it seems that the old life is swept away in order for a completely new one to occur. When, the Sun is in aspect to Pluto renewal, reinvention and even resurrection will always be there. In Elvis’ case, it continued long after he was actually dead, with reports of his reappearance a frequent occurrence. But then Elvis’ Pluto was in the 8th house of death so this feature was underlined in his chart. Classical music does not have the same associations with this reckless, partying lifestyle, not these days anyway, but there is one performer whose life was very strongly affected by the Sun / Pluto opposition. Jacqueline du Pré, however was not an ordinary classical musician. She was widely regarded as a uniquely talented cellist who achieved an enduring mainstream popularity normally associated with the above rock gods. Du Pre had a chart with a number of very powerful opposition aspects. This is when two planets are pulling in opposite directions and these as a rule are aspects of difficulty and tension. It is as if the person has to face more than the average number of challenges from fate. The planets in astrology that are known as personal ones are the Sun, Moon, Mercury, Venus and Mars. They rule the person’s essential self, emotional make up, thinking and communicative processes, ability to create and attract others and personal drive and assertiveness. Each of these planets in Jacqueline Du Pre’s chart is part of an opposition aspect, so all of them are being challenged constantly. None more so than the Sun with its aspect to Pluto. Pluto is the god of the underworld, and people with it strong in their chart are always being required to dig deep into themselves to find inner resources of strength and talent that nobody else can match. When the Sun is opposite Pluto, they are forced to do so in order to cope with the difficulties life throws at them. The fact that Pluto is in the 5th house of creativity, shows that du Pre’s gifts and musical inspiration came from another level altogether. Her sensitivity and the depth of feeling in her work came from the Moon in Cancer ( a placing she shares with Pablo Casals ) right at the base of her chart. The Moon, however is conjunct Saturn, the planet of limitation and restriction. These two are in opposition to an exact Mercury / Mars conjunction in Capricorn in the 10th house of career. Mars in Capricorn in the 10th is about as clear as you can get for someone who has a dynamic and auspicious career, and this conjunction showed someone who would get to the very top of her own tree. However the opposition to the Moon and particularly Saturn shows something inside herself would frustrate her ambitions and performance. This opposition focuses by T Square onto an apex Neptune in the 6th house. A T square will always take the challenging energies of the opposition and express them strongly through the apex planet. Neptune is the planet of the spiritual but also of mysterious and unexplained phenomena. When aspected positively it can be extremely uplifting, when it receives difficult aspects it often works to undermine everything. It essentially requires us to let go, but it can force us to do that by dissolving the very ground under our feet. 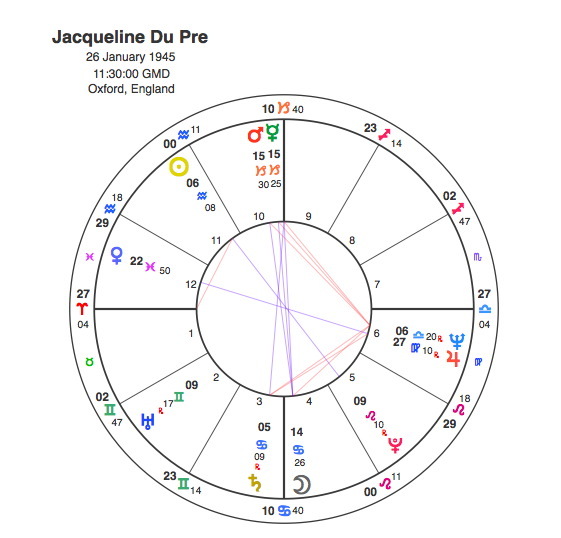 Jacqueline du Pre’s apex Neptune was in the 6th house of health. Her wonderful career was cut short by multiple sclerosis, which forced her to stop performing at the age of 28. She battled the illness for many years, which ultimately resulted in an untimely death. All the articles on this website are a testimony to the power of Pluto’s transits. When someone has the planet in aspect to the Sun at birth, this power is magnified. When Pluto made its only transit to du Pre’s Neptune ( the conjunction ) and Saturn ( a square ) in October 1973 she was diagnosed with MS and was forced to stop concerts. The most powerful transit that can happen in a lifetime is that of Pluto to the Sun. Pluto made its only transit of du Pre’s life to her Sun / Pluto opposition between 1986 and 88. After fighting the condition for many years, Jacqueline du Pre died in October 1987. Venus we all know is the goddess of love. Pluto was opposite du Pre’s Venus in 1967 when she married pianist Daniel Barenboim. Jacqueline’s Venus was at 22 degrees 50 Pisces, Daniel’s Venus at 22.23 Scorpio and his Sun in exact conjunction at 22.36 of the sign. Pisces and Scorpio are both Water signs and this powerful exact trine aspect is a love at first sight contact. Its the kind of thing that would make someone change their religion and even their whole life in order to marry. Barenboim’s Sun and Venus was in the 10th house of career along with the same combination that du Pre had there, the Mercury / Mars conjunction. Again this is a sign of someone who would reach the very top of their profession, but within the Sun and Venus there, it would be a much more sustained career than that of his wife. Also there are no planets to oppose this 10th house stellium and no T Square to Neptune to undermine it. The most difficult thing in his chart is the Mars / Pluto square aspect. Pluto is close to the cusp of the 7th house, the place in the chart that rules marriage. Pluto made its only transit to his Mars in 1987, when Jackie died. Jacqueline du Pre was no Elvis, turning up in all kinds of places long after his death, but if she did choose to return along with Jerry Garcia and Bob Marley, most of Capricorn Research’s generation could themselves die happy.